Easter Art Squared Give away!! I'm no fan of lingering seasons. If it feels like September at Christmas I'm bummed. If winter goes too long and doesn't offer any significant snowfall then I say be gone you slushy cold gray skies and bring forth my favorite season...SPRING!!! So as a little kick in the pants to the worn out your welcome winter I'm gonna do our Easter giveaway now! Just like our Valentine giveaway I'll be drawing a name out of a mixing bowl and the name will come from a pool of blog comments. Again, I'm encouraging any of you that have not tried to leave a comment already to give it a shot now. AOL blogs are a bit tricky with the logging in process, but trust me, it's easy and painless. You only have to come up with a unique user name and password (word to the wise...write it down...we all have so many passwords already). The winner, drawn this Sunday will win our brand new Easter 4" x 4"! So please leave a comment if you want a shot at this little cutie. 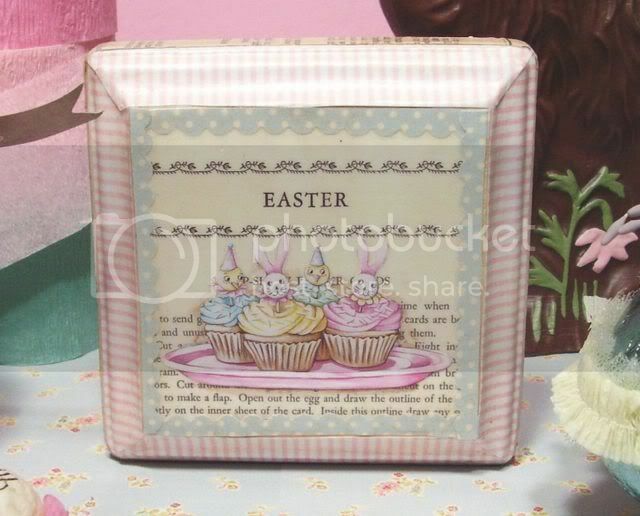 The little image of the Easter cupcakes is a downsized version of our 8"x 10" edition. The chick and bunny cupcake toppers are directly inspired by a set we own and you can sorta glimpse them on the left in the photo. I want to thank you all so so much for the awesome comments on the last entry...so sweet! I just knew that so many of you probably felt the same in your lives. Every artist has "the gift and the curse" complex. And when I say artist I'm not referring to what one can do with their hands, but what one see's and feels. There is not one of us in blogland that can even grasp the idea of not being totally obsessed with this stuff. We would have no idea how to exist in a vanilla world...strangely, we sometimes wish we could...but then we look around our room or wherever and meet eyes with a sawdust filled Easter bunny from the 1940's, his felted fur in the perfect shade of pale turquoise...and we say to ourselves: no way am I giving THAT up! Oh, one more thing...February is too short! We're extending it til the end of Saturday by having an End of February Sale...15% off any purchases over $40 through Saturday. We're working on an email to our list but for any bloggers interested just mention the February Sale in a note with your purchase. Wow. It looks like I'm the first to comment here! Am I the only one who sits and works in front of a computer day (and night?)? LOL I love your Easter Art Squared! The colors are so cheerful, just what we need for these days of winter, when we want days of spring! Spring will come! Anyway, back to the art... The bunnies are just too cute! The art is so real that I want to reach over and grab a cupcake and take a bite! I love your painted house with mini objects, too. I'll have to keep an eye out for one of those! I do have an old Cola bottle box that could possibly be used, but then I probably shouldn't paint that! Happy March! I missed the last one although I did buy the cute V-Day 4x4! I love adding to the collection. Even if I don't win, I am buying one because they make me happy! i love all your stuff--the colors are not my usual style but are so refreshing and delicious!! thanks for your inspiration and encouragement for all us "artist" types that think with the other side of our brain. I love the Easter Cupcakes - add me to the entry list! Come on over to my blog for a Spring swap, girlie!!! Love your housie-house, it's just too sweet. You know we all love your old spirit! Bring on SPRING!!! Your house looks so yummy! Did you make the little chick and bunny picks? They are adorable too. oh my gosh, you are filled with endless yummy ideas!! Love your Easter craftiness! Your blog is a joy to read. What absolutely delicious looking colors on your little houselet! And the tiny chocolate bunny is just wonderful. Thanks so much for the inspiration. I now have a craving for little houses. hi, i just found your blog a few weeks ago and have been totally inspired by your art, colors and general attitude towards life. definitely sign me up for the drawing! Oh and rocketqltr is me, Pamkittymorning! I hope I win, I hope I win, I hope I win!!!!!!!!!!!!!!!!!!!!!!! So, I'm Finally de-lurking. I've been reading you site for months, enjoying all your wonderful craftiness. I'd really like to have my name in your bowl. Thank you! Oh...please add me!!!!! I've always wanted a piece of your artwork!!!! I forgot to add my email too! Oops..
Oh, yummy! Count me in! You are so creative & talented, Jenny! Thank you so much for sharing everything you are up to. I love to see your creativity at work. Due to time, been paring down my blogs-to-visit but yours is right at the top of my permanent list -- I like your style -- art/food/hair -- all -- thanks for such inspiring fun! Delurking here. I read your blog several times a week. Love your work and would love to own this little beauty. I would LOVE to be entered in the drawing!!! 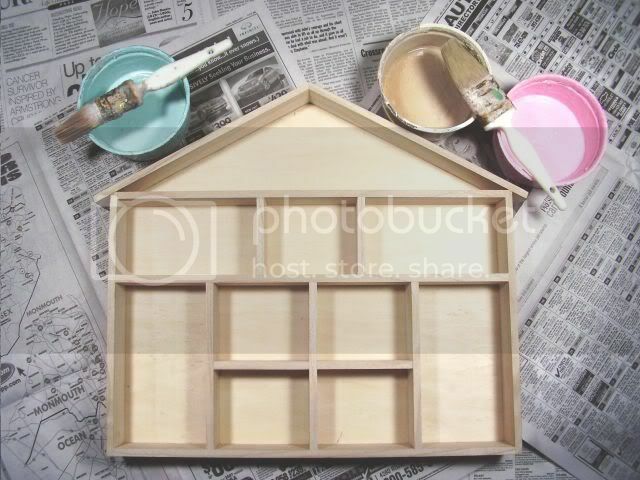 Your shadowbox house is SO ADORABLE!!! I have been wanting to make one of these and you have certainly inspired me to give it a try! Now I just need to find some cool goodies to put inside!!! OOOps. My email is smith2236@bellsouth.net. Oh yay! I would love to have that adorable Easter piece!! I've got to start making some Easter things too, now that I have a new printer! :) I LOVE your art- it SO inspires me!! Uhhh I love all your little minis, and this one is no exception. OK - that aol thing was a little wacky. Love your work, please throw my name into the Easter Art give away. What a great picture! What a wonderful gift he gave to you! Thanks for sharing! I thought that your new ornament of the lady (with the blond pigtails) holding the cake looked familiar! I admire both of you! You are both very talented artists and I visit your site daily to watch for new listings. Your items are absolutely adorable! I want it all! I would love to see the inside of your house. I imagine it looks like something out of a fairy tale. Thank you for offering these wonderful creations! OOH! How exciting! I love reading your blog! You and Aaron are an inspiration for the rest of us crafties! Thanks Jenny! Oops! I belong to amyelisedesign! My e-mail amyelisedesigns@yahoo.com. Thanks again!! Very, very cute! Love reading your blog and seeing all your beautiful things. Love your work. And the shadow box idea is great. I scout out at Target and get deep frames there for similar but had not thought to do a multiple item one. How perfect is the little house!!! What yummy inspiration you provide! My dad was a baker his entire life, started washing pans in a small bakery at age 15 and ended up owning his own wonderful shop in Longmont, Colorado which he had for 23 years. Sadly cancer took him from us almost 12 years ago. I love all things bakery and have been so pleased to discover your art. Thanks for sharing with all of us through your blog. oohh...throw my name in! The bunny cupcakes are adorable! You have some of the most amazingly beautiful and delectable pieces of artwork I have seen! This easter giveaway is gorgeous! I just want to reach out and take a bite out of one of those pastel cupcakes! I'll give it another shot! I adore all the gorgeous eye candy you share with us - thanks! HOLY COW you're at it again...I just can't keep up with you! I will go broke collecitng your things I swear! :) but at least I'll die happy! surrounded by the things I love most! tee hee! Beauiful colors!, it makes me want to munch down a bag of pastel Jordan almonds RIGHT NOW! or my favorite speckled chocoalte eggs with the candy shell mmmmmm or just decorat Eater eggs! Isn't inspiration great? I'll contact you soon to order more! Love the Easter square!! So sweet! I can't wait for my new kitchen then I can get some of your sweet art to hang! The shadow box is TOO wonderful! I have to say I love your blog! It's such a cute whimsical place to visit each day! And I would absolutely love to be entered into the drawing for the Easter Art. I think this little Easter art squared is one of my favorites...not that I'd ever really be able to pick a favorite of yours. They're all fabulous!!! I CANNOT WAIT to see pics of your Easter decor. Please enter me in the drawing, sweetie! Oh... March has finally arrived... and I wake up to a new blanket of snow. I'm so looking forward to Spring, little buds appearing on tree limbs and warmth. 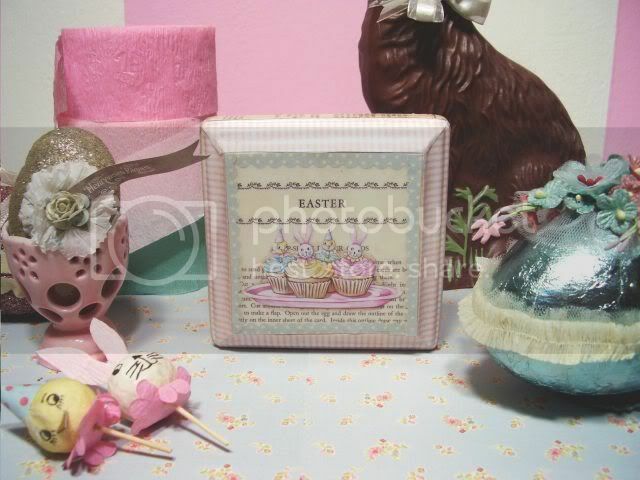 Your Easter Cupcake 4 x 4 is too adorable and really needs to journey to Ohio where it will be put on display and admired. Sending lots of messages out to the Universe... "pick me, pick me, pick me"
Just found your blog and oh, my, I love it! How in the world does someone have such incredible talent! Now, I'm off to go reading all of your previous posts! I would so love to win your little 4x4! lOVE THE NEW PHOTOS YOU POSTED! oh, me me, pick me!!! So cute!!! God I love coming here!!! what fun! You're too sweet! 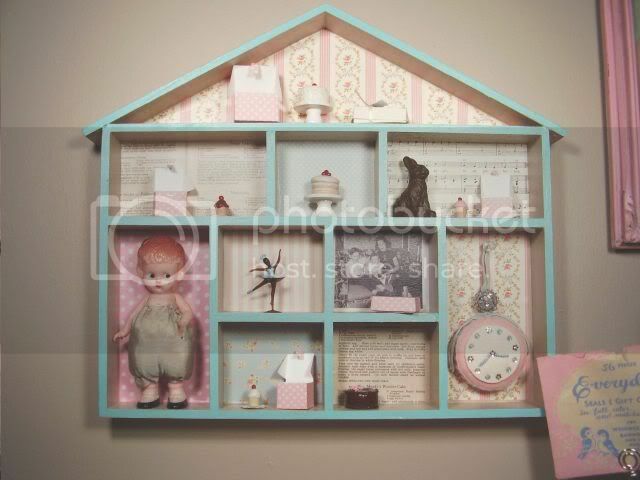 LOVE your spring shadowbox house! Oh please, count me in!! You do beautiful and unique work. I'm very impressed! How fun and you are so sweet to share. Put my name in -pretty please. That little 4x4 would be perfect for my small (but growing) Easter collection!